The PKCS#11 standard describes an API for cryptographic operations which is used in scenarios where cryptographic secrets need to be kept secret, even in case of server compromise. It is widely deployed and supported by many hardware security modules and smart cards. A variety of attacks in the literature illustrate the importance of a careful configuration, as API-level attacks may otherwise extract keys. Formal verification of PKCS#11 configurations requires the analysis of a system that contains mutable state, a problem that existing methods solved by either artificially restricting the number of keys, introducing model-specific over-approximation or performing proofs by hand. 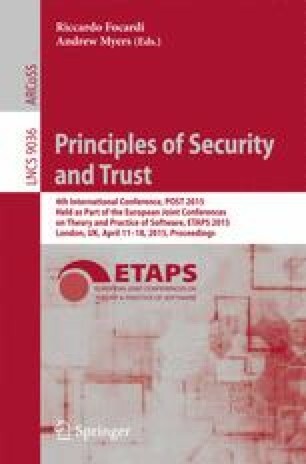 At Security & Privacy 2014, Kremer and Künnemann presented a variant of the applied pi calculus that handles global state and, in conjunction with the tamarin prover for protocol verification, allows for the precise analysis of protocols with state. Using this tool chain, we show secrecy of keys for a PKCS#11 configuration that makes use of features introduced in version 2.20 of the standard, including wrap and unwrap templates in an extensible model. This configuration supports the creation of so-called wrapping keys for import and export of sensitive keys (e.g., for backup or transfer), and it permits the co-existence of sensitive keys and non-sensitive keys on the same device.